Histamine, Primary culture, Glioma, Apoptosis. In the recent years, it had been reported that histamine could induce the Ca2+ influx into the C6 glioma cells [1,2]. Studies had shown that Ca2+ played an important role in the cell proliferation, differentiation and apoptosis, and was the physiological factor that could induce the apoptosis . The intracellular Ca2+ overload was the initiating factor of apoptosis, and the final common pathway towards the cell damage and death . The drugs that could induce tumor cell Ca2+ influx thus exhibited the important research values. However, the studies done by the international scholars were limited to the initial observation of glioma cell strains, and lacked the direct validation from the in vivo tumor histamine specimens and the further studies. To determine whether histamine could induce Ca2+ influx in human glioma cells (HGCs), and further cause the tumor cell’s apoptosis, the human brain glioma tissues obtained via the surgical means were performed the primary cultivation to observe the intracellular Ca2+ concentration changes and cell apoptosis, and the results were reported below. The fresh glioma tissue mass was rinsed with serum-free culture medium, cut into 1 mm 3 size pieces, and added into 0.25% trypsin for the 30 min digestion at 37°C water bath, followed by the filtration through 100 mesh filter, and 10 min centrifugation at 1500-2000 rpm in a low-speed centrifuge (Beijing Medical Centrifuge Plant), then removed the supernatant liquid. The precipitate was then re-suspended with the calf serum-free culture medium, and centrifuged twice with the same speed and time as the above, then removed the supernatant, re-suspended the precipitate with 10% calf serum 1640 culture medium (Shanghai ShiSheng company), and counted, and 5 × 105 cells/well were implanted into the 96-well culture plate for the incubation at 37°C and in a CO2 incubator (NAPCO. Model 5410, USA), the growing cells were collected for the immunohistochemical staining, then compared with the original surgical pathology results to confirm the incubated cells as the glioma cells. The cells with good growing conditions at the 48th h were obtained and discarded the culture medium, then added with the equal volume of 0.01, 0.05 and 0.1 mg/ml histamine-containing culture medium (prepared with 10% FBS 1640 culture medium, Sigma, USA), and labelled as Group I, II and III, at the same time, the non-histamine containing culture medium group was used as the control group. After 1, 3 and 7 days of dosing, the cells of the experimental groups were placed in 5 μmol/L Fluo-3/AM, 5 μmol/L Pluronic F-127 (Sigma, USA) and 1 ml Hanks solution, loaded for 40 min at 37°C, and rinsed 3 times with non-fluorescent probe containing Hanks solution. Intracellular fluorescence was excited by using the 488 nm band of an argon ion laser scanned through the computer controlled galvanometer mirrors of CLSM (MRC-1024, Bio- RED company, USA). Emitted fluorescence passed through a long-pass filter (515 nm cut-on) and was collected by a photomultiplier tube. The Ca2+ concentrations were acquired and processed with a CLSM-FLUOVERT system with an inverted microscope . 1, 3 and 7 d after dosing, the cells of the experimental group were collected, digested, centrifuged at 1000 r/min for 5 min, the supernatant was removed and the precipitate was loaded with propidium iodide, 10000 cells were counted by FACS Calibur FCM (BD Company, USA) to calculate the percentage of apoptotic cells. The experimental data were statistically performed the t-test with SPSS13.0 software and expressed as the mean ± standard deviation. A total of 10 human glioma tumor masses were taken, 8 males and 2 females, with two cases of polymorphic glioblastoma, six cases of astrocytoma, and two cases of medulloblastoma. The successfully cultured tumor cells initially appeared round and well-dispersedly suspended in the culture medium. 24 h after the cultivation, the cell suspension could be observed stretching and adhering. Observing under an Olympus inverted microscope, the tumor cells varied in shapes and sizes, with spindle cells as the dominant, and interlaced with triangular or polygonal shapes. The protrusions on cells were small, extending from the cell body to the surroundings, and the cytoplasm was seen to contain the round translucent secretory granules. The nuclear size differences were pronounced, mostly oval, and located centrally or deviated in the cells. The number of nucleoli increased, and the polynulear cells and megakaryocytes were observed. The GFAP immunohistochemical results were positive, the cytoplasmic staining appeared brown, and the nuclei appeared blue after the haematoxylin re-staining. Under CLSM, the cells appeared oval, star or polygon shaped, with slender microvilli protruding on cell membrane, and the nuclei were large. The nuclear membrane was double-layered and had dark coloration. Heterochromatin accumulated at the edge of nuclear membrane, with pronounced nuclear invaginations, the nucleoli could not be clearly seen, and the cytoplasmic matrix were loose, with many pale stained and scattered glycogen granules inside (Figure 1). The cell growth curve was shown in Figure 2. Figure 1. 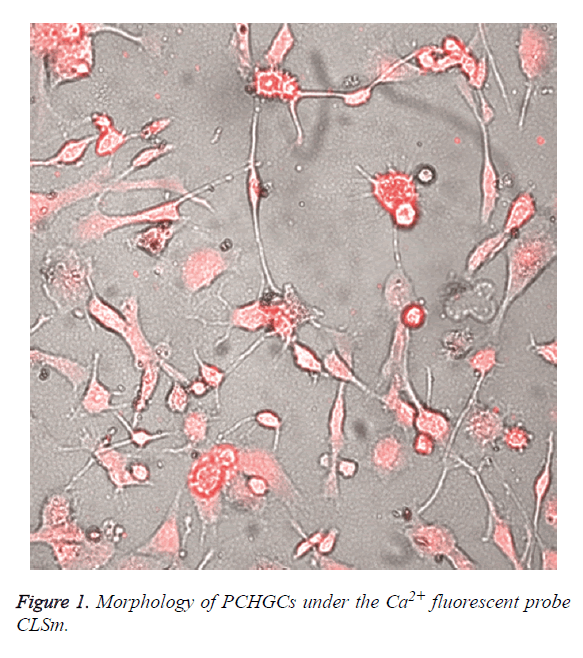 Morphology of PCHGCs under the Ca2+ fluorescent probe CLSm. Figure 2. 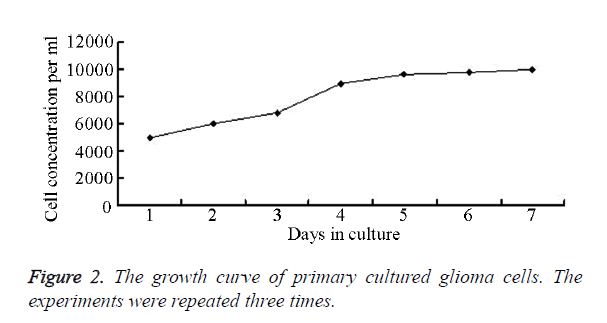 The growth curve of primary cultured glioma cells. The experiments were repeated three times. Compared with the control group, the dosing group had significantly lower cell numbers, less cell color, much more irregular morphology, and the cells were non-adherent and vacuolated. The section 144 h was the most pronounced and the 0.1 mg/ml group was the most significant, while 0.01 mg/ml group was the least pronounced. Based on the formula of cell growth inhibition rate G1=(1 Nt/No) × 100%, the cell growth rate was decreased by 16%-38%, shown in Figure 3. Figure 3. 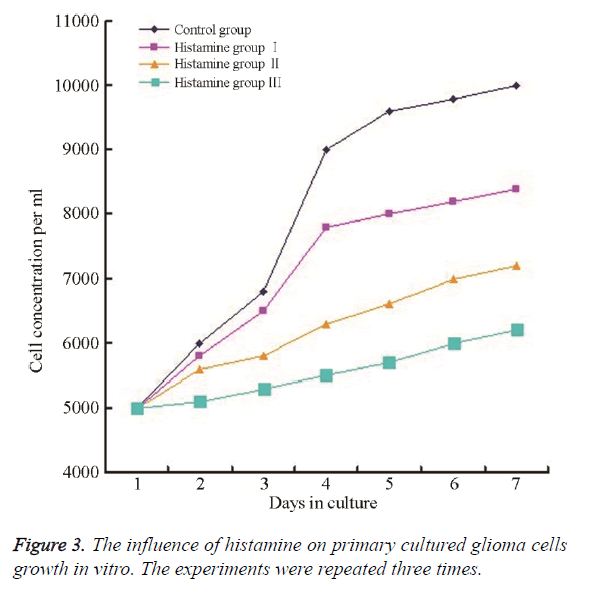 The influence of histamine on primary cultured glioma cells growth in vitro. The experiments were repeated three times. The Ca2+ concentration were significantly increased in the PCHGCs cytosol in the histamine-added group and the difference was statistically significant when compared with the control group (P<0.05) (Table 1). Note: *Compared with the control group, P<0.05; **Compared with the control group, P<0.01. Table 1. Effects of histamine towards the intracellular Ca2+ concentration changes in PCHGCs (μmol.L-1, ͞x ± s, n=6). With the increasing drug concentrations and prolonged exposure periods, the apoptosis was significantly increased, and the difference was statistically significant when compared with the control group (P<0.05) (Table 2). Table 2. Effects of histamine towards the PCHGCs apoptosis (%, ͞x ± s, n=6). It had been confirmed that in the mammalians, the histamine was produced from the histidine by the decarboxylation of L-Histidine Decarboxylase (HDC), and was a substance with significant and extensive intrinsic bioactivities. Therefore it played a key role in many physiological functions and was an important neurotransmitter in the brain [5-7]. Histamine worked by binding the specific receptors in various target tissues. A total of 4 types of histamine receptors had been found, namely, H1, H2, H3 and H4 receptor . The histamine receptors were vastly present in various human tissues and organs, including the cerebrum, cerebellum and spinal cord . In the recent years, the increasing attention had been paid on the relationships between the histamine and malignant tumors; studies had shown that histamine H1 receptor was expressed in a variety of different malignant tumors (including the brain malignant tumors), the intrinsic levels of histamine in the patients with malignant solid tumors were significantly lower than the normal, and further decreased with the disease progression, and both the tumor metastasis or resection would affect it significantly . Therefore, the endogenous histamine was closely linked with the occurrence and development of malignancies . Other authors suggested that the exogenous histamine could inhibit the tumor growth, and might promote the degeneration inside the tumor tissues [11,12]. In the animal experiments, the combination of histamine with the chemotherapy drugs might reduce the dosage of chemotherapy drugs and could achieve the good efficacy, significantly slowed down the tumor growth, and reduced the intra-tumoral micro vessel density [11,13]. The histamine could theoretically increase the penetration of chemotherapy drugs into tumor interior, and appear to have a goal-directed treatment effect . The mechanism towards the suppression of tumor proliferation by histamine still remained unclear, some literature suggested that the histamine could inhibit the production and release of oxygen free radicals by the macrophages, neutrophils and other phagocytic cells protect the natural killer cells and T-cells from the oxidative injury, thus indirectly exerting the anti-tumor effects . The other studies suggested that the anti-tumor effects of exogenous histamine were achieved through the H1 receptor, and the possible mechanism might be activating the H1 receptor, reducing tumor blood flow, increasing the permeability of tumor blood vessels, and accelerating the body’s own anti-tumor factors to enter the tumors, the tumor blood vessels were much more sensitive to the effects of histamine compared to the normal vessels [11,16]. In order to clearly understand whether the histamine could induce the PCHGCs Ca2+ influx, thus leading to the apoptosis of tumor cells, we primarily cultured HGCs obtained through surgery then observed the intracellular Ca2+ concentration changes and cell apoptosis after adding histamine to the cells. The results showed that, compared to the control group, the histamine-treated HGCs had statistically significantly different intracellular Ca2+ concentrations than the control group, and the different concentrations of histamine resulted in the statistically significant intracellular Ca2+ concentrations, indicating that the histamine could increase the intracellular Ca2+ concentration, and this was closely related to the histamine concentration and action duration. The histamineinduced increase of intracellular Ca2+ concentration was mainly related with the H1 receptor, and this increase included both the intracellular Ca2+ mobilization and the extracellular Ca2+ influx, which could be blocked by H1 receptor antagonists [17-19]. The histamine was the active metabolite of phosphatidylinositol, many studies had confirmed that the activated histamine H1 receptor could break down the phosphatidylinositol 4,5-disphosphate (PIP2) into triglycerides (DG) and inositol triphosphate (IP3) by G protein-coupled phospholipase C. The IP3 receptor (IP3R) was present on the cell membrane, endoplasmic reticulum and nuclear membrane. IP3 was the Ca2+ release channel, when IP3 bound with the endoplasmic reticulum/sarcoplasmic IP3R, IP3R would undergo the conformational changes, causing the Ca2+ stored in the endoplasmic reticulum/sarcoplasmic reticulum to be released into the cytoplasm. Also, IP3 alone, or together with its metabolite IP4, could open the sensitive Ca2+ channels on the cell membrane and promote the influx of extracellular Ca2+ [20,21]. The current studies had found that the changes of intracellular Ca2+ concentration were an important cause of apoptosis. The intracellular Ca2+ concentration increase could directly activate some proteolytic enzymes, or act as a third messenger to affect cellular gene expression, thus inducing the apoptosis or death. The intracellular Ca2+ overload was the initiating factor towards the neuronal cell apoptosis, and the final common pathway of nerve cell damage and death . The above experiments showed that, compared with the control group, the histamine-treated PCHGCs significantly increased the number of apoptotic cells, with the statistical significance, and with the increase of drug concentrations, the experimental groups exhibited the statistically significant differences towards each other, indicating that the histamine could induce the PCHGCs apoptosis with a concentration-dependent effect; also, with the increase in action duration, the apoptosis increased significantly, indicating that histamine-induced cell apoptosis also had the time-dependent effect. This conclusion provided a theoretical basis for the continuous drug administration to maintain the intratumoral drug concentration in the clinical treatments. The apoptosis was the process of programmed cell death triggered by the external factors, and a growing number of studies had shown that the sensitivity of tumor cells to the apoptosis signals might be the key factor in determining the effects of chemotherapy. The traditional chemotherapy mainly inhibited the continuous proliferation of tumor cells. However, due to the lack of tumor specificity, the chemotherapy often damaged the normal tissues as well. With more in-depth research towards the drug application, it had been recognized that the specific tumor cell apoptosis induction might be an attempt with the most prospects, and glioma cells were the tumor cells that were sensitive to the chemotherapy-induced apoptosis [22,23]. Activation of endoplasmic reticulum-Ca2+ release by protein kinase C inhibitors could be involved in apoptosis . Terfenadine modulates Ca2+ homeostasis and induces apoptosis through other cellular pathways involving tyrosine kinase activity . In addition, the resistance of glioma cells towards the chemotherapeutic drugs was also related to the apoptosis inhibition. The induction of apoptosis in glioma cells might be the basis of successful glioma treatment. Our study showed that the histamine could increase the intracellular free Ca2+ concentration in PCHGCs, thereby inducing the apoptosis. This study was supported by National Natural Science Foundation of China (30070272); Shandong Provincial medicine and health "Ninth Five" research program (No. 8 Luwei key research). Tseng CL, Wei JW. Homologous desensitization of histamine-mediated signal transduction system in C6 glioma cells. Chin J Physiol 2013; 56: 90-100. Tseng CL, Wei JW. Investigation on signal transduction pathways after H (1) receptor activated by histamine in C6 glioma cells: involvement of phosphatidylinositol and arachidonic acid metabolisms. J Chin Med Assoc 2012; 75: 143-150. Roderick HL, Cook SJ. Ca2+ signalling checkpoints in cancer: remodelling Ca2+ for cancer cell proliferation and survival. Nat Rev Cancer 2008; 8: 361-375. Saito SY, Kamiyama S, Oda M, Nakahata N, Ohizumi Y. Inhibitory effect of Mao-Bushi-Saishin-to on prostaglandin E2 synthesis in C6 rat glioma cells. Biol Pharm Bull 2004; 27: 1133-1135. Fennell LM, Fleming JV. Differential processing of mammalian L-histidine decarboxylase enzymes. Biochem Biophys Res Commun 2014; 445: 304-309. Naddafi F, Mirshafiey A. The neglected role of histamine in Alzheimer's disease. Am J Alzheimers Dis Other Demen 2013; 28: 327-336. Kletke O, Sergeeva OA, Lorenz P, Oberland S, Meier JC, Hatt H, Gisselmann G. New insights in endogenous modulation of ligand-gated ion channels: histamine is an inverse agonist at strychnine sensitive glycine receptors. Eur J Pharmacol 2013; 710: 59-66. Wang M, Wei X, Shi L, Chen B, Zhao G, Yang H. Integrative genomic analyses of the histamine H1 receptor and its role in cancer prediction. Int J Mol Med 2014; 33: 1019-1026.
del Rio R, Noubade R, Saligrama N, Wall EH, Krementsov DN, Poynter ME, Zachary JF, Thurmond RL, Teuscher C. Histamine H4 receptor optimizes T regulatory cell frequency and facilitates anti-inflammatory responses within the central nervous system. J Immunol 2012; 188: 541-547. Grimbaldeston MA, Green A, Darlington S, Robertson BO, Marshman G, Finlay-Jones JJ, Hart PH. Susceptibility to basal cell carcinoma is associated with high dermal mast cell prevalence in non-sun-exposed skin for Australian populations. Photochem Photobiol 2003; 78: 633-639. Johansson M, Henriksson R, Bergenheim AT, Koskinen LO. Interleukin-2 and histamine in combination inhibit tumour growth and angiogenesis in malignant glioma. Br J Cancer 2000; 83: 826-832. Massari NA, Medina VA, Cricco GP, Martinel Lamas DJ, Sambuco L, Pagotto R, Ventura C, Ciraolo PJ, Pignataro O, Bergoc RM, Rivera ES. Antitumor activity of histamine and clozapine in a mouse experimental model of human melanoma. J Dermatol Sci 2013; 72: 252-262. Kanda N, Watanabe S. Histamine inhibits the production of interferon-induced protein of 10 kDa in human squamous cell carcinoma and melanoma. J Invest Dermatol 2002; 119: 1411-1419. Lázár-Molnár E, Hegyesi H, Pállinger E, Kovács P, Tóth S, Fitzsimons C, Cricco G, Martin G, Bergoc R, Darvas Z, Rivera ES, Falus A. Inhibition of human primary melanoma cell proliferation by histamine is enhanced by interleukin-6. Eur J Clin Invest 2002; 32: 743-749. Donskov F, Middleton M, Fode K, Meldgaard P, Mansoor W, Lawrance J, Thatcher N, Nellemann H, von der Maase H. Two randomised phase II trials of subcutaneous interleukin-2 and histamine dihydrochloride in patients with metastatic renal cell carcinoma. Br J Cancer 2005; 93: 757-762. Ohuchi Y, Yanai K, Sakurai E, Fukui H, Yanagisawa T, Watanabe T. Histamine-induced calcium mobilization in single cultured cells expressing histamine H1 receptors: a relationship between its sensitivity and the density of H1 receptors. Int J Mol Med 1998; 1: 355-360. Jung S, Pfeiffer F, Deitmer JW. Histamine-induced calcium entry in rat cerebellar astrocytes: evidence for capacitive and non-capacitive mechanisms. J Physiol 2000; 527: 549-561. Fioretti B, Catacuzzeno L, Sforna L, Aiello F, Pagani F, Ragozzino D, Castigli E, Franciolini F. Histamine hyperpolarizes human glioblastoma cells by activating the intermediate-conductance Ca2+ activated K+ channel. Am J Physiol Cell Physiol 2009; 297: 102-110. Barajas M, Andrade A, Hernandez-Hernandez O, Felix R, Arias-Montaño JA. Histamine-induced Ca2+ entry in human astrocytoma U373 MG cells: evidence for involvement of store-operated channels. J Neurosci Res 2008; 86: 3456-3468. Sharma A, Choudhury S, Nakade UP, Yadav RS, Garg SK. Calcium influx and release mechanism(s) in histamine-induced myometrial contraction in buffaloes. Anim Reprod Sci 2014; 146: 157-164. Bonneau B, Nougarède A, Prudent J, Popgeorgiev N, Peyriéras N, Rimokh R, Gillet G. The Bcl-2 homolog Nrz inhibits binding of IP3 to its receptor to control calcium signaling during zebrafish epiboly. Sci Signal 2014; 7: 14. Yoshida D, Watanabe K, Takahashi H, Sugisaki Y, Teramoto A. Apoptotic induction by BE16627B on human malignant glioma cell lines by an anti-matrix metalloproteinase agent. Brain Tumor Pathol 2003; 20: 13-19. Nitta M, Muragaki Y, Maruyama T, Iseki H, Ikuta S, Konishi Y, Saito T, Tamura M, Chernov M, Watanabe A, Okamoto S, Maebayashi K, Mitsuhashi N, Okada Y. Updated therapeutic strategy for adult low-grade glioma stratified by resection and tumor subtype. Neurol Med Chir 2013; 53: 447-454. Montero M, Lobatón CD, Gutierrez-Fernández S, Moreno A, Alvarez J. Modulation of histamine-induced Ca2+ release by protein kinase c. effects on cytosolic and mitochondrial [Ca2+] peaks. J Bio Chem 2003; 278: 49972-49979. Jangi SM, Ruizlarrea MB, Nicolaugalmés F, Andollo N, Arroyoberdugo Y, Ortegamartínez I, Díaz-Pérez JL, Boyano MD. Terfenadine-induced apoptosis in human melanoma cells is mediated through Ca2+ homeostasis modulation and tyrosine kinase activity, independently of h1 histamine receptors. Carcinogenesis 2008; 29: 500-509.